Tolfdir is an elderly mage who lives in the College of Winterhold. He is a professor and serves as the quest giver for the first few quests of that faction. After the quest Under Saarthal he will most likely be found in the final chamber of Saarthal, studying the Eye of Magnus. Later, after starting Hitting the Books, the Eye and Tolfdir will move to the Hall of the Elements. After The Eye of Magnus quest is completed, he is usually found in the Hall of Attainment. His room is the first to the left from the entrance on the ground floor. 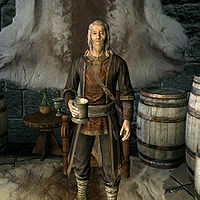 Tolfdir wears master robes of Alteration and a pair of boots. He knows the Alteration spells Ironflesh and Stoneflesh, the Destruction spells Fireball and Flames, and the Restoration spell Steadfast Ward. The Eye of Magnus: Reclaim the College and contain the Eye. 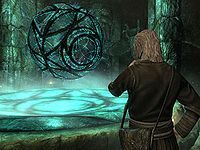 Tolfdir the Absent-Minded: Help Tolfdir find his missing alembic. This is the merchandise found in Tolfdir's merchant chest. These items are only available if purchased from the merchant; they cannot be pickpocketed or stolen. They are restocked every two days. Tolfdir has heterochromia iridum. His right eye is hazel and his left eye is green. During the College quest The Staff of Magnus, Tolfdir is made Master Wizard, replacing the late Mirabelle Ervine. 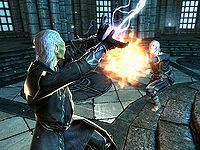 Despite you being named Arch-Mage of the college by completing The Eye of Magnus, Tolfdir is effectively in charge of the college after that point, and you have no more power or influence over the NPCs of the college than you did before. Tolfdir is also the one you have to answer to if you steal, assault someone, or otherwise break the college's rules and end up being forced to complete the quest Rejoining the College. When explaining the existence of the Augur of Dunlain, he does it in a different voice than how he normally speaks. ?